Tiger Woods (associate) announces revised plan for important Chicago public course. 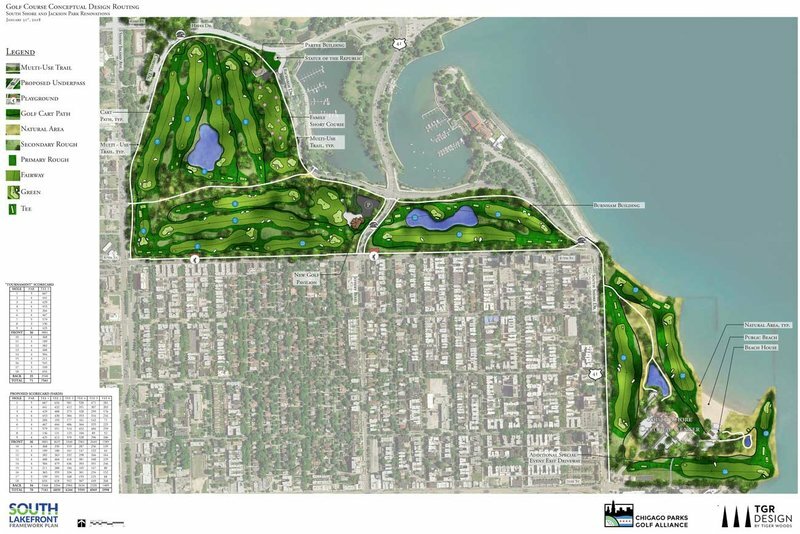 Various news sources last week reported on revised plans being released for the controversial Jackson Park golf project in downtown Chicago. To be designed by Tiger Woods Design, the plan involves the merging of two inexpensive public courses into one ‘championship’ test capable of hosting major events, whilst remaining playable to the general public. A familiar refrain. The latest plan for Jackson Park apparently follows dozens of variations, all involving the direct input of Tiger Woods. The course will cost around $30 million to build, with funds generated via private investment. The city of Chicago will still have to pay for various infrastructure works, including street closures and a $30 million underpass. Of greatest concern to golfers in the inner city, are the likely fees to be charged by the new facility. Officials have said green fees are projected to be $50 for residents, and significantly higher for visitors. Residents currently pay between $25 and $35 depending on days and whether they have golf access cards. While Tiger himself wasn’t in attendance to showcase the new routing plan, his associate Beau Welling spoke of Tiger’s passion for the project and public golf in general. The President of Tiger Woods Design Bryon Bell later added that although Woods didn’t attend the project launch, he will return to Chicago once it has the green light to proceed. Tiger apparently reduced his design fee to take the job, and was introduced to the project by former President Barack Obama. Welling told an audience of about 300 at the South Shore Cultural Center on Wednesday night that Woods’ main goal in the project is to attract area youth. He would not have gotten involved if the project walled off access. The plan also calls for a short course of six holes ranging from 50 to 100 yards and a junior clubhouse where the current one sits in Jackson Park. There would be a short-game area and practice greens near the clubhouse, but designers cannot relocate the driving range from its current location, north of the course. Too cramped.